Jules has made the brave decision to show off her operation scars. 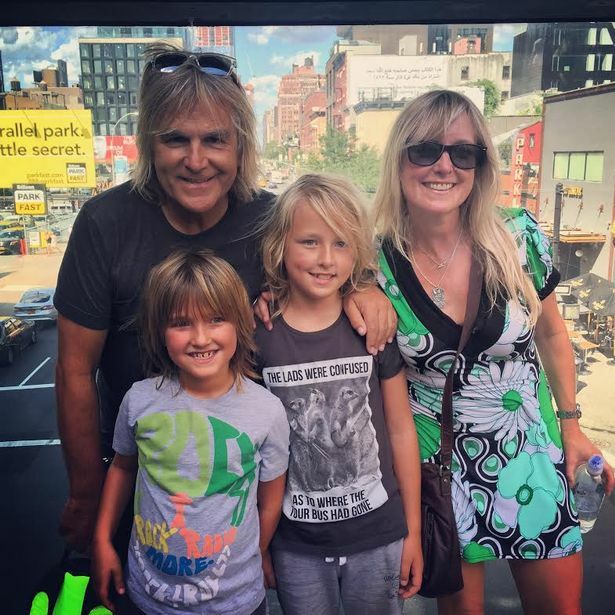 Welsh rock couple Mike and Jules Peters have opened up on the life-changing journey Jules has faced with breast cancer. 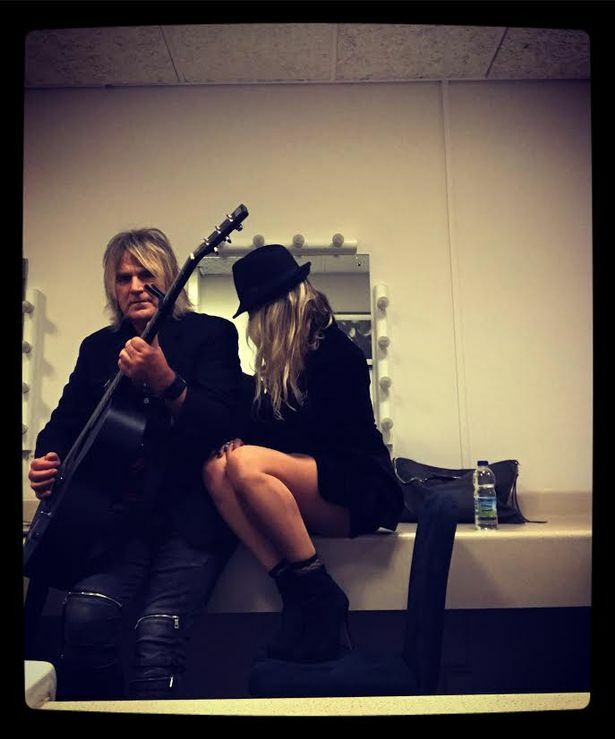 After revealing in October last year that she had been diagnosed with the disease, the North Wales-based frontman of The Alarm – himself a three-time cancer survivor – and his wife have spoken out about her own very public cancer fight. The pair, who have been filmed for a BBC Wales documentary – Mike and Jules: While We Still Have Time to be broadcast next week, are no strangers to cancer. Mike was first diagnosed with cancer in 1995 and has fought the disease three times. 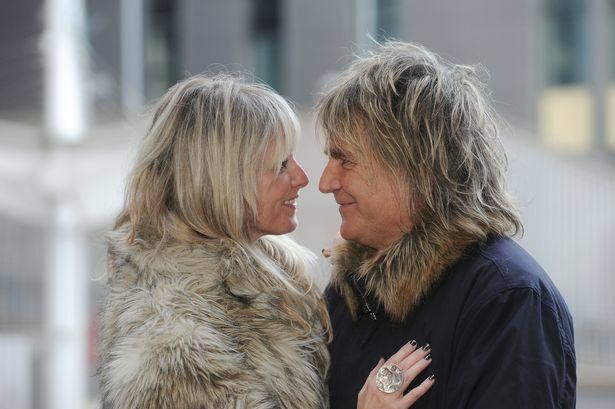 Now thankfully in remission once more after being administered with a pioneering new drug, the man who co-founded the global rock ’n’ roll cancer charity Love Hope Strength, saw his world turned upside down once again as his rock and his soul-mate received the life-changing news that she had breast cancer. It was during Snowdon Rocks in June last year – the annual trek to the highest peak in Wales – in aid of Love Hope Strength, that Jules’ own cancer journey was about to begin. On the descent from the mountain she was speaking to Emyr Afan, the owner of Avanti – the production company who have created the BBC documentary about Mike and Jules. He told her how urgent it was that she checked herself thoroughly. 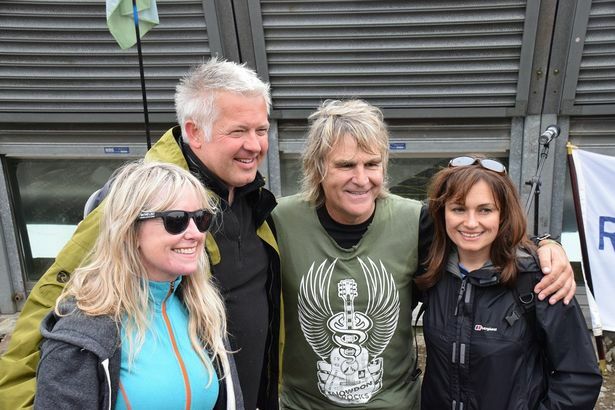 Photo: 2016 Snowdon Rocks with BBC Weather presenters Derek Brockaway and Sue Charles. “Because Emyr had been going on about it so much I made a point of thoroughly checking myself and that’s when I discovered a lump,” she recalled. It was July 4, American Independence Day, when she received confirmation that the lump she had discovered was cancerous. For the football-mad Peters family, who live in Dyserth, North Wales, it was a bittersweet time. “All this was happening around Wales doing brilliantly at Euro 2016,” Jules recalled. “We were big on throwing football parties for all our friends and families. We had open house, pizza, beer and watched the football all throughout the competition. Photo: Jules and Mike in 2016 photographed by Andrew James. In the space of a month Jules underwent two operations. The first, it was hoped, would be a simple operation to remove the lump, but unfortunately Jules’ cancer story was far from straightforward. “During the first operation a second lump was discovered and removed,” she said. However, while Jules and Mike both felt the op was successful, at that point they weren’t aware the surgeon had found a third area of cancer. Photo: Jules’ has bravely chosen to show off the scars from her second surgery. When she returned to hospital, she was given the devastating news that she would need a further operation. “While the surgeon was operating his finger touched something that didn’t feel quite right to him,” said Jules, who manages The Alarm and looks after Love Hope Strength in the UK. At this point Mike was on a US tour and Jules had to break the news that more cancer had been discovered during one of the greatest moments for the musician. On the day Jules was given the news that she needed a second operation, Mike had taken his charity Love Hope Strength – which he founded with American cancer survivor James Chippendale – to the heart of the US Government at Capitol Hill in Washington, where they were making some of the most powerful congressmen in America aware of their work, courtesy of a donor drive, attempting to find matches for blood cancer sufferers by swabbing the mouths of those signing up to the Love Hope Strength donor register. Instead of one of the happiest days of his life, it was one of the darkest. The third tumour discovered was high up in the breast wall and it was hoped a second operation would successfully remove the cancer. Unfortunately there was yet another setback lying in wait – more areas of cancer had been detected. The indomitable wife of the equally indomitable rock star, faced the biggest fight of her life. Aware that the breast cancer has spread to the lymph nodes, the need for chemotherapy was urgent. Undergoing 18 weeks of chemotherapy, followed by a four-week period of radiation treatment every single day she figured it would be a lot to contend with – and so it ultimately proved. 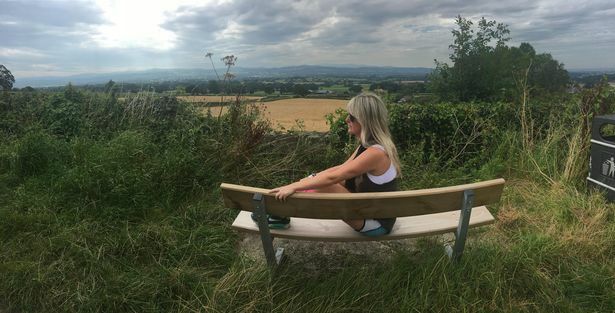 Photo: Jules in the countryside near her home in North Wales. Jules, who celebrated her 50th birthday in April, hatched a plan to see her through the dark times and keep her in the best of health. “Because of the surgery on my breast I was told I couldn’t run, so I approached it by a doing a lot of walking,” she recalled. “I would walk back and forth the ten miles to the North Wales Cancer Centre (at Ysbyty Glan Clwyd in Rhyl). “Exercise has always been important to me and when the surgeon told me I couldn’t run I knew that would destroy my physical and psychological well-being, so I decided to walk as far as I could. “I didn’t want to relax on the sofa, as that would have made me feel weak, vulnerable and upset. She added: “Walking became my mantra. It was fantastic therapy. It helped my mental health no end. Sometimes I didn’t want to get out of the front door but I forced myself to. 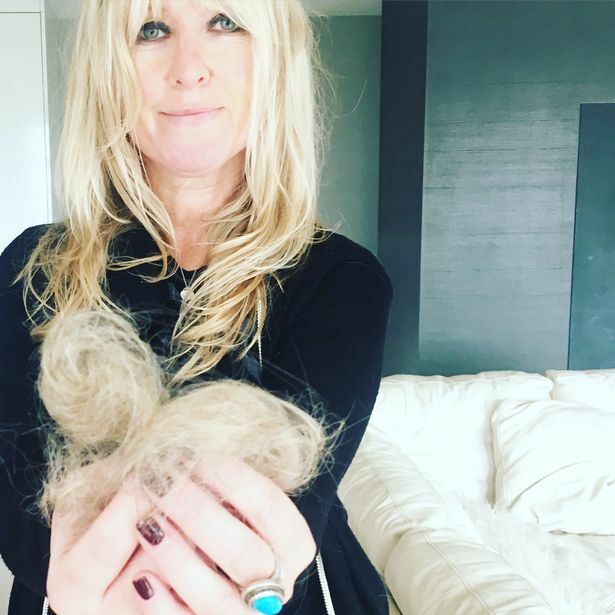 Photo: Jules pictured with the clumps of hair that had fallen out. Instantly identifiable, much like her husband, for her blonde hair, Jules admitted she was terrified of losing this distinctive part of her. 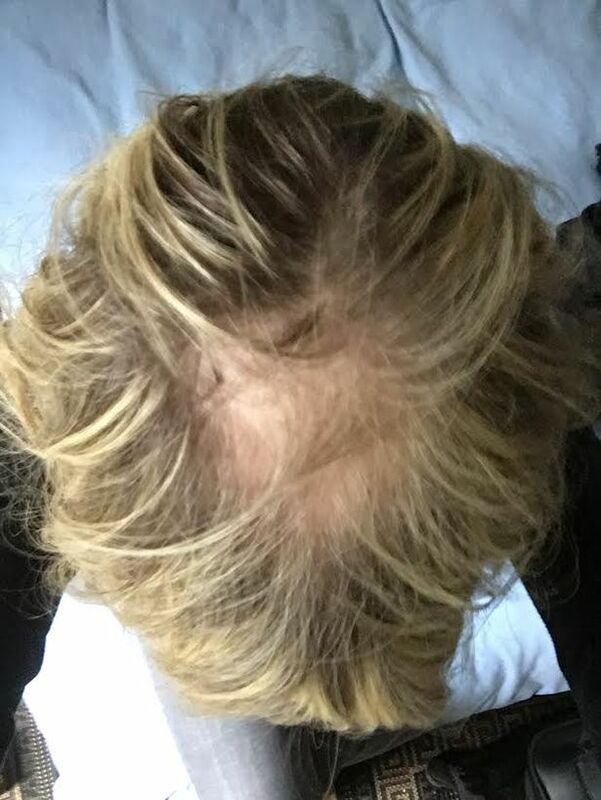 Despite using a cold cap, which keeps the chemotherapy from circulating into the brain and destroying the hair follicles, in an attempt to save her hair, she experienced some drastic hair loss. “The cap has been extremely effective but you still do lose hair,” she said. “I remember it was November and I had just got back from the World Cancer Congress in Paris, when my hair started to come out in clumps. Photo: Jules reveals the bald patch as her hair started to fall out. “A lot of cancer patients feel very guilty and embarrassed discussing the idea that the thought of losing your hair is bothering you, because, of course, first and foremost eradicating cancer is your priority. 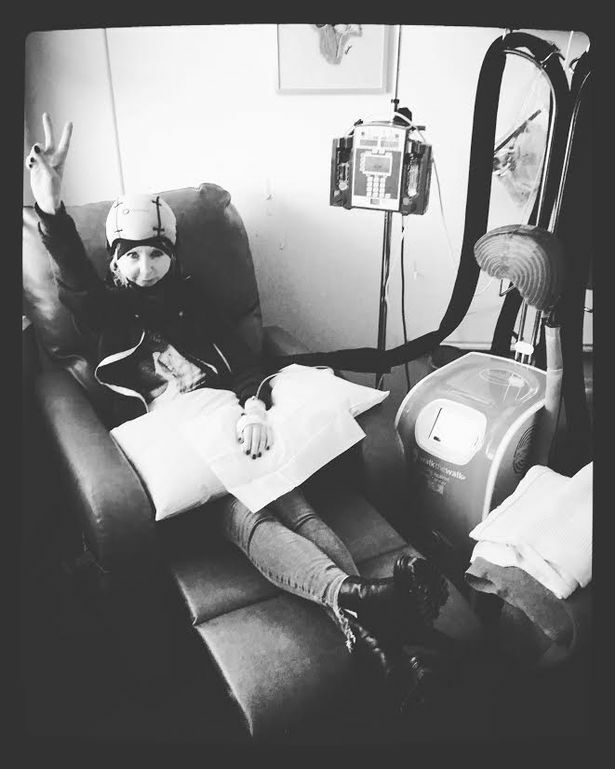 Photo: Jules pictured using the cold cap during chemotherapy. Having to deal with the scars of surgery on her breast, and then hair loss, pushed her to the limit. Ahead of her chemotherapy treatment she had been fitted for a wig which she dubbed Trixie and kept on a mannequin in her bedroom. As her hair fell out she wore a number of different hats to disguise the hair loss, but it was in January of this year at the annual Mike Peters and The Alarm convention The Gathering that Trixie finally made her debut. Photo: Jules pictured wearing her wig ‘Trixie’. “Trixie had stayed sat on the mannequin, but when Mike insisted I join him on stage with the band to play keyboards that’s when I decided it was time for Trixie to make an appearance. 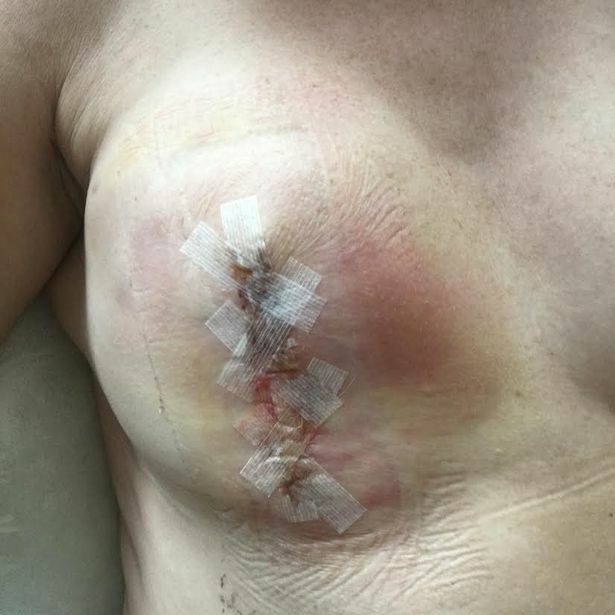 There was to be further emotional and physical upheaval for Jules when post her radiotherapy treatment, which she started in March, she suffered burns to the area around her breast as a side-effect of the treatment. “I responded badly to the treatment and it was another blow that I had to deal with,” she said. Photo: Jules and her radiotherapy burns. Call it sixth sense, but Jules said she had always expected to have a cancer diagnosis at some point during her life. “I have had some weird instincts that I was going to have cancer at some time. When I married Mike I was aged 19, and I remember saying to him then, ‘You know our life together is going to have some incredible ups and downs.’ I just felt that back then – and that’s the way it’s turned out. We’ve had some incredible highs and terrible lows. Jules feels, although can’t be certain, that the breast cancer may have arisen from IVF treatment when trying to conceive more than a decade ago. “There is a link between IVF and breast cancer, they make you aware of it at the start of the process and I went through four full attempts at IVF,” she said. Photo: Jules pictured with Mike wearing a hat during the time she was going through chemo. While Mike is renowned for his heroic battles with cancer, Jules has had her own medical emergencies to contend with, underlining the great highs and lows the couple have endured through their 30 years together. Eight years ago she found herself in hospital in Liverpool having contracted two life-threatening blood clots and a mystery African virus following a Love Hope Strength charity trek to the summit of Mount Kilimanjaro in Tanzania. Although long clear of the illness, it has left her needing to wear compression socks to stave off the threat of blood clots in her legs. “They think it was linked to a miscarriage I suffered after surprisingly conceiving naturally prior to heading out to Africa, but it’s never been clarified,” she said. 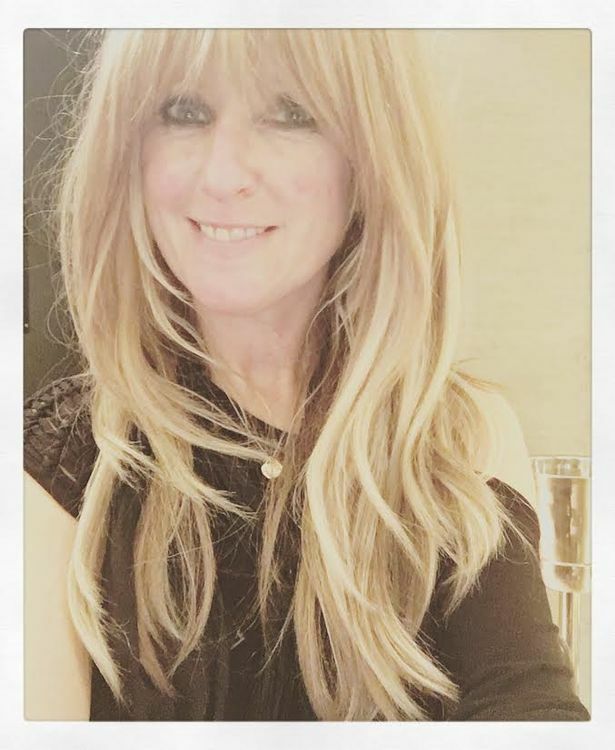 Photo: Jules in the US celebrating her 50th birthday on April 16, 16 days after finishing 12 rounds of chemotherapy and 20 days of radiotherapy. 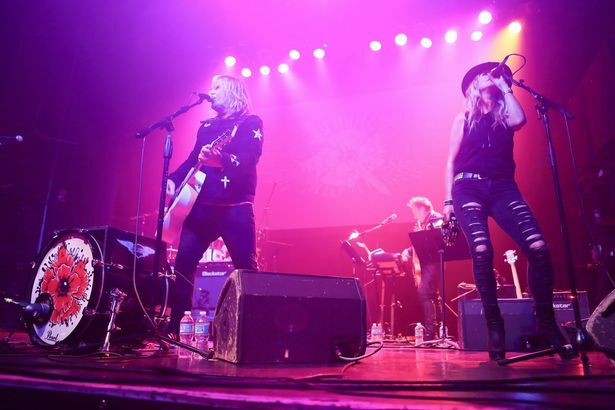 Now through her chemotherapy and radiotherapy treatment, Jules will spend the summer on tour with The Alarm, and will be taking her two boys Dylan and Evan along for the ride. In September she will have reconstructive surgery on her breast and will be guided through the process by her brilliant surgeon Mr Ilyas Khattak. “He’s been incredibly important in creating a positive atmosphere and taken on board I am someone who wants to cling on to their femininity,” said Jules. “Some people are ‘happy’ to have a mastectomy, but he fought hard with his team to decide what is best for me. “After removing the cancer they have saved me from having a mastectomy. He will match up my left breast with my right and I will have pert new breasts like an 18-year-old hopefully,” she laughed. Photo: Mike Peters and his family. Left to right – Mike Peters, Evan Peters, Dylan Peters, Jules Peters. There was, however, one last jolt for the couple as Mike’s mum passed away last month, aged 87, after receiving a lung cancer diagnosis in December. “She had a stroke 10 years ago which made life uncomfortable for her and meant she was housebound,” said the 58-year-old singer, whose sister suffered a brain haemorrhage, aged 35 in 1989, which left her unable to recognise Mike or his family. and his dad died the following year in 1990, aged 64, a broken man after struggling to cope with his daughter’s tragic plight. But she loved visitors and loved seeing her grandkids. She was an amazing lady. Just before Christmas she took a turn for the worse when doctors discovered she had lung cancer and she didn’t have long to live. She decided she didn’t want any treatment and that it was her time to go now. Photo: Mike and Jules performing on stage together at The Gathering NYC. For Mike and Jules they now face the future as changed people from the battles they’ve faced, but together they’re stronger as cancer has redefined them, offering them a renewal and a reawakening of their relationship. Professionally they’ve never been busier. Mike has written a new Alarm album – Blood Red, a very personal set of songs created over the course of Jules’ treatment. 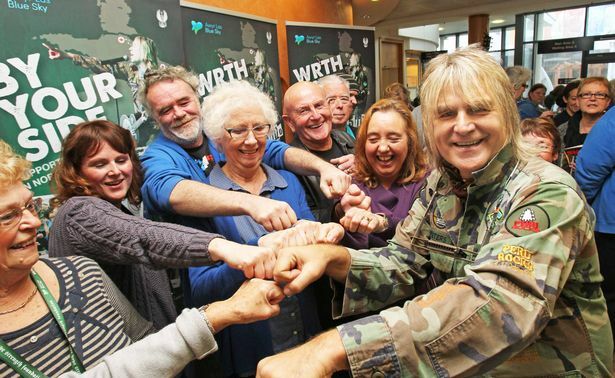 A UK and US tour is one of their biggest yet, and the pair are undertaking a huge challenge when they walk 130 miles across North Wales for the Awyr Las Charity in June, raising hundreds of thousands of pounds for the cancer units that have saved both their lives. “When you experience a cancer diagnosis there are huge moments of bleakness,” said Jules. “Everything goes from kaleidoscopic to black and white. Photo: Mike raising money for Awyr Las/Blue Skies at Ysbyty Glan Clwyd. Despite the prospect that the cancer could return, Jules feels adamant. “The treatment was so potent I believe it won’t come back, it feels like Domestos has been poured down the drain. 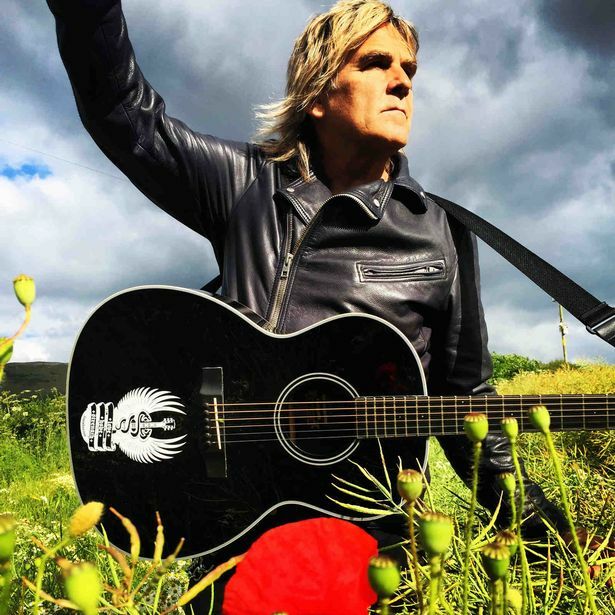 Mike and Jules: While We Still Have Time will be broadcast on BBC One Wales on Monday, May 22, at 9pm, and the programme will be immediately followed on BBC Two Wales at 10pm with Mike Peters: The Alarm Live – highlights from this year’s 25th Anniversary of The Gathering.